Every business is crazy about getting to the first page of Google and we can understand why. Hubspot says that 75% of people never even make it to the second page of Google. If you don’t have a strategy to get you to the top then there is very little chance that you’ll ever get noticed. When we were gathering information for this article we noticed that others believed that you could not get to the first page of Google. In fact, many specialists called it idealistic. They pushed the idea that businesses have to buy ads to get on the first page. We know this is not true. Especially if you are a small or local business, Google is on your side. If you’ve been trying for some time to get on the first page of Google and failed, there is one reason for that. You have no SEO strategy. Getting on the first page of Google search results requires a mix of SEO knowledge as well as hard work. In this article we are going to help you better understand how to get your business on the first page of Google. It’s well-known that using SEO the right way can skyrocket your traffic. SEO deals with using the right keywords in order to boost organic traffic to your website. However, to do it right, you need to understand the difference between short-term SEO keywords and long-tail keywords. Shorter keywords that consist only of 1 or 2 words that are highly competitive. In the meantime, more descriptive phrases are often better quality and easier to rank for. Long-tail keywords require specification. A standalone long-tail keyword doesn’t work miracles, but including several of them will do the trick. How do you compose the right long-tail keyword? In the example on the left the search results are overcrowded with high-profile and popular websites. Meanwhile, the results on the left are represented by less popular websites. All we did was add a target audience to the three main keywords. 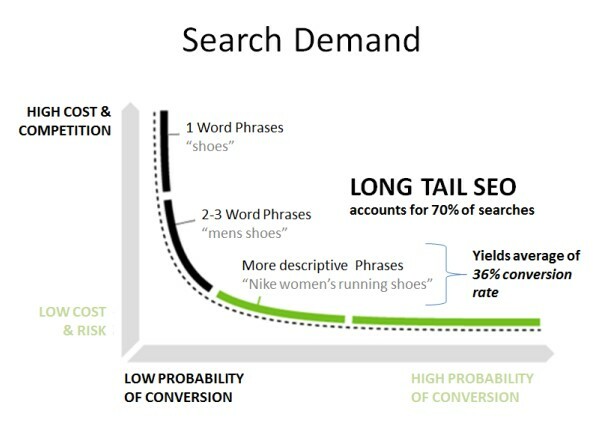 Long-tail keywords are more effective because they target more specific information. This is where small businesses can stand out. Most small businesses service a small area. If you want to get your business on the first page of Google you need to dominate these long-tail keywords. Once you have determined what long-tail keywords you want to rank for then you need to start creating content around those keywords. You want to create high quality, long, valuable content that people want to read. However more importantly that people also want to share and link to. The purpose of Google is to provide the best and highest quality information to people searching for information. Thus, if you want to get your business on the first page of Google, make sure that your content is high quality and provides value to others. Google will reward you for being so giving. After you are done writing an amazing piece of content, you should send your content to people who have shared similar content. They are more likely to share your content and be happy to deliver that value to their readers. If you are struggling to write engaging content then this article will teach you how to make engaging content. If you are a small business then you should be reaching out to local businesses in your area to get inbound links, send your content to new agencies, find local bloggers to work with. If you provide valuable content then people will want to link to you and backlinks will naturally form. I know when we started that we said you did not have to pay to get to the top of Google. This is true, however; if time is not on your side, then running a Google Ads campaign can instantly get you to the top. Working with organic ways of promoting your website, depending on your competition, still see average results. The reason why is if you are still shown below three or four ads. This environment can hurt even the top performing SEO techniques. Google is a business and you need to take this into consideration before you make your strategy. If you want to learn more about Google Ads read this Foolproof Guide to Setting Up a Google Ads Campaign. Getting your business on the first page of Google requires a lot of work. You need to provide your visitors with high-quality valuable content and then you need to spread your message far and wide. However, you also need to have a strategy to get there. If you are struggling to devise a plan, message us today!